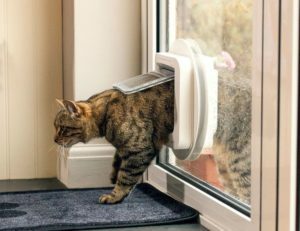 We sell a window kit for cat size pet doors, and this kit works with the AB10 and AB21 pet doors. These kits are low-cost and a good option for those who live in an apartment. The flap on the door will need replacement every 2-5 years, depending on usage and climate. The AB10 can be mounted through a glass pane. To install this door you will need to have the glass replaced – window glass is tempered and cannot be cut. Your local glass experts can make a pane with the right hole size. We also make custom window inserts with dog doors, and these start at $570. Measure your window and call customer service at 800-749-9609 from 10 AM to 4 PM, Monday – Friday. These inserts are a higher quality window option for those who want a door that will last for years.